I just finished reading "Life So Far: A Memoir", by Betty Friedan, who is hailed as the mother of feminism. I highly recommend you pick up a copy of the book because it provides you with an unmatched window into the psychology of what motivated the creation of the modern feminist movement (this blog will be the first in a series of blogs on the notes I took from the book). One of the things that stood out to me immediately when I read the book was how Betty started right ranting about how she hated her mother because she was a housewife who didn't have a career. Betty was so obsessed with career-womanhood that she even said a prayer asking God to give her a career when she grew up, so this fixation on career obsession as a panacea bordered on a religious belief for her as you can see from the following passage on page one of the book. On page sixteen of the book she goes into detail about how privileged a life her mother had and how she hired female maids to do her housework for her. She did nothing for herself. 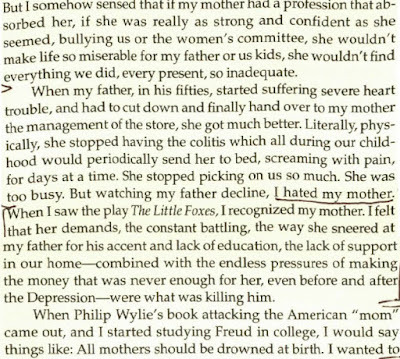 On page eighteen she goes into more detail about how entitled and materialistic her mother was. On page nineteen she says that her mother ran their lives and conspired with the children to keep secrets from their father. So their mother ran their lives not their father. 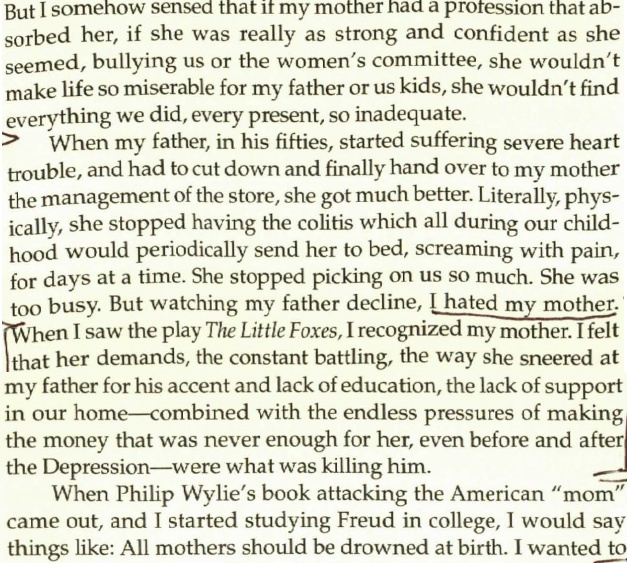 Another similar passage on page 30 further illustrates her loathing for her mother growing up. On pages 30-31 there is a chilling quote from her where she states that she would go around saying that she believed all mothers should be drowned. She also says that she believed her mother's sense of entitlement was killing her father in the passage. 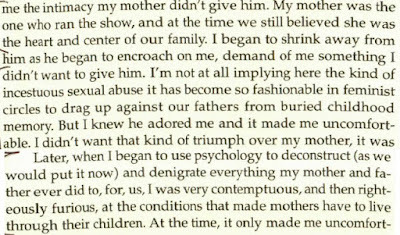 And finally, on page 32, she admits that digging up stories about how fathers abused their daughters was fashionable in the feminist movement. 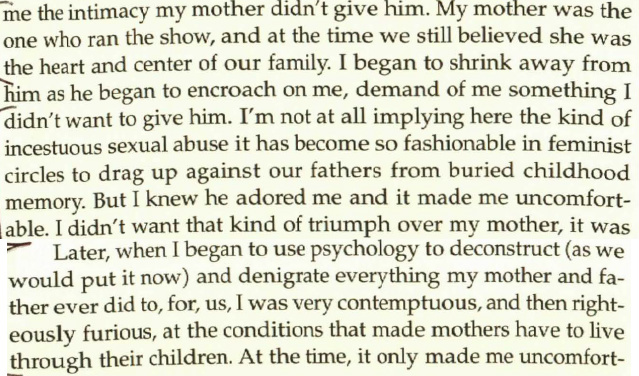 She also talks about how she would use psychology to "deconstruct" everything her parents ever did for her or to her. She attempts to blame society for forcing mothers like her own mother to "live through their children" when obviously her mother was dominant enough to have had a career if she wanted it.